You are here: Home / Blog / Commercial & Retail Lighting / What is a Compact Fluorescent Ballast? What is a Compact Fluorescent Ballast? 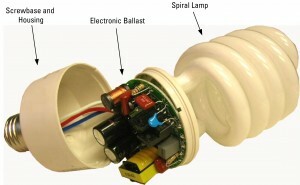 A CFL bulb with an integrated ballast. These are also called “self-ballasted” CFLs. Image from EE Times. As efficient lighting design continues to evolve, more and more projects use alternatives to traditional incandescent lamps. 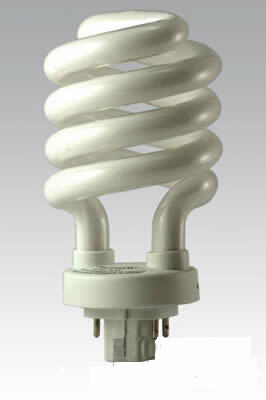 The easiest and most common option is the compact fluorescent lamp, or CFL. Along with a transition to CFLs comes a need for a fluorescent light ballast to control the current of electricity. To understand what a compact fluorescent ballast does, one must first be acquainted with what a compact fluorescent lamp is all about. Like incandescent lamps, the CFL aims to put out a bright, yet soft, stream of light. It just produces that light in a different way. Incandescent v. Compact Fluorescent: They Both Glow, So What’s the Difference? An incandescent bulb relies on an electric current that is carried via wire to meet a filament. The filament creates resistance to the electricity, and causes the lamp to heat up and glow. On the other hand, CFLs use an electric current that is passed between two electrodes. This electric current, also known as an arc, is achieved from a regulated supply of high voltage. That’s where our fluorescent light ballast comes in! Think of a CFL ballast as a bank lender dealing in electric currency, and each compact fluorescent lamp as a client applying for a loan. To begin the business of lighting up, a CFL needs a sudden and powerful influx of electric current to establish an arc between its two electrodes. Akin to seed money that a bank provides a small business to get started up, the fluorescent light ballast delivers the voltage in one lump sum. This quick, controlled jolt creates the arc. The bulb, however, needs electricity in a steady stream in order to produce the bright, even glow that we want. It’s the ballast’s job to dole out the power a bit at a time. A pin-base CFL bulb with no ballast built in. The ballast must be incorporated into the fixture. Image from Planet Bulb. You may have heard of integrated and non-integrated fluorescent light ballasts. The integrated option combines the lamp tube and ballast in one piece. These will usually resemble incandescent bulbs with an ability to screw in the base or attach with compatible connectors. A non-integrated fluorescent ballast is housed inside the lighting fixture itself, rather than the lamp. This method is typically more costly on the front end, but after the initial investment, can allow for savings in the long run. Non-integrated ballasts may operate on internal or external starters and should be installed by a professional electrician or skilled contractor. Or choose the easiest option: Purchase a light fixture with the ballast built in, like Architect Design Lighting’s ballasted warehouse shade pendant. What Does CFL Mean For My Lighting Project? In one word, savings. Switching to CFL means lower electricity usage and lower energy costs. Depending on the lamp and ballast combination, CFLs can operate on a fraction of the energy consumed by incandescent bulbs and last up to 10 times longer – or greater in some cases. If you’ve decided to change over to CFL, what does that mean for your light fixtures? A ballasted light fixture may be the best option for your project. Give ADL a call and we can walk you through the pros and cons.